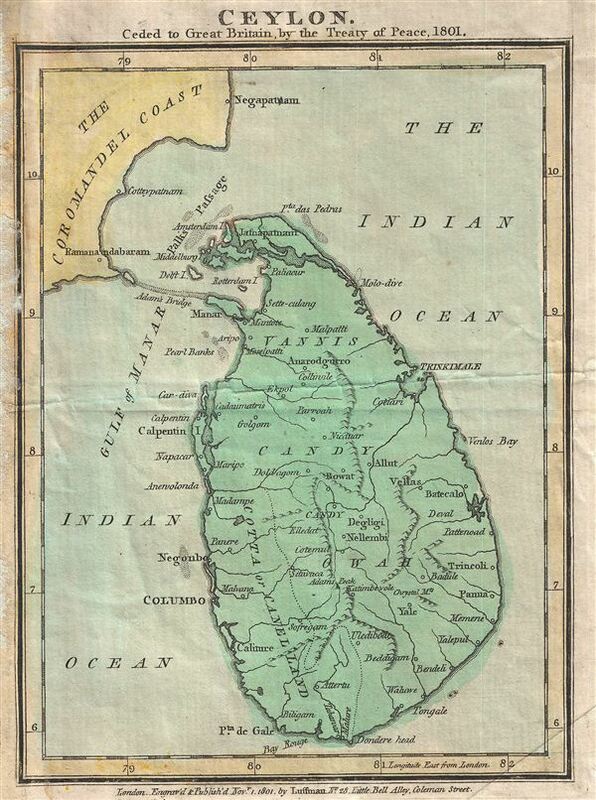 Map showing the British takover of Ceylon in 1801. This beautiful 1801 map by John Luffman marks an important moment in the history of Ceylon (Sri Lanka), as well as the history of France, the United Kingdom, and the Dutch (then 'Batavian') Republic. In 1795 the Portuguese controlled kingdoms that made up Ceylon were passed to the Dutch, themselves a client state to France.In 1801, the French, eager to end nine years of almost continuous warfare with various coalitions of anti-Revolutionary France European powers, began negotiations with England on the Treaty of Amiens. When the minor participants in the negotiations (the Batavian Republic and Spain) arrived, they were presented with faits accomplis: Ceylon and Trinidad had been ceded to England, along with a guarantee of free shipping to the Cape of Good Hope, in exchange for restoration of the other colonies lost to the British since 1795. The Treaty began the one and only year of peace between the French Revolutionary Wars and the Napoleanic Wars, which would last until 1815 (together sometimes referred to as the 'Great French War'). John Luffman (fl. c. 1776 - 1820) was an engraver, mapmaker and publisher, active in London during the late 18th and early 19th centuries. Though established as a bookseller and publisher, Luffman began his career as an engraver. His earliest cartographic work was a series of maps for two road 1776 books, Mostyn John Armstrong's An Actual Survey Of The Great Post-Roads Between London And Edinburgh and Taylor And Skinner's Survey And Maps Of The Roads Of North Britain, Or Scotland. Later, he issued A New Pocket Atlas And Geography Of England And Wales in 1803. Luffman built his business by quickly responding to political events with illustrative maps produced just as interest in particular regions waxed: for example his map of Napoleon's proposed naval invasion of England and his map of the island of Ceylon following its 1801 takeover by England. Very good. Minor damage to left margin where originally bound into an unknown volume.